Happy Monday! I wanted to share one of the fun activities that we started this week. I told you our class is working on timelines and today I sent home a project for their personal timelines. Last year I found these from Really Good Stuff. I thought this was perfect and ordered them. They were a bit small and you have to cut the pictures to make them fit in the little squares. There isn't much room for the kids to write on either, but it does help them to organize their work. Here is my daughters that she created last year. Here is my oldest daughters from 3 years ago on construction paper. 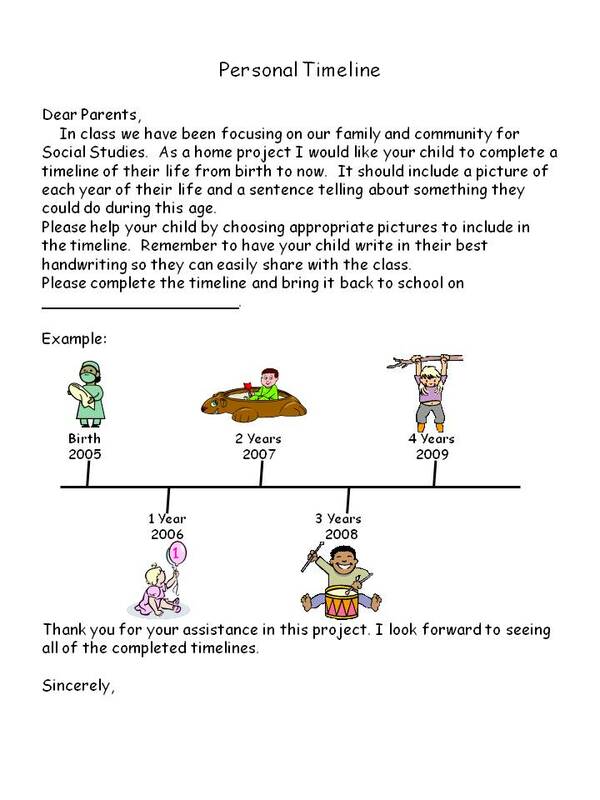 I send home a letter telling parents what we are doing and include a sample picture of a timeline. I remind them that this is a family project, not a parent project, so that the writing and decorating should be done by their child. I usually give them two weeks to complete them and then we begin sharing two or three timelines per day. I love your timelines. I have a teaching partner. She teaches social studies to her class and mine and I teach science to both classes. Every year they do timelines in the spring. She gives them index cards and yarn, with directions and a demo of how to put them together. She lets them draw pictures or put photos in. They do an oral presentation, then they are hung in the hallway for everyone to see. These are a hoot! To see these second graders as babies is so funny! She lets the parents help with the writing. The sad thing is in our area, some people have moved so many times, they don't have those pictures to share. I'll try to send you a picture of what ours look like? Oh my gosh I love this! I have been raving over your blog to all my second grade girls here at work, and I'm so excited to use my Birthday Timeline from you! Is there anyway you can share the parent letter explaining how to do this? This is a great project! Thank you for sharing.